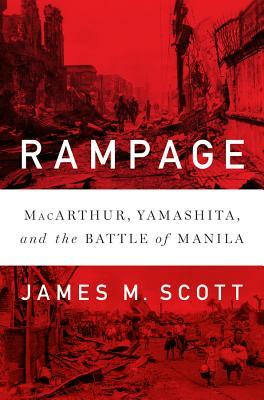 Rampage: Macarthur, Yamashita, and the Battle of Manila (Hardcover) | Eagle Harbor Book Co. This is the account of General Douglas MacArthur's much-storied, promised return to Manila in February, 1945, which marked the long-awaited liberation of two, eventually three, internment camps. Though the general expected that the enemy would retreat, it remained entrenched, and what followed was a horrendous twenty-nine-day battle, one that destroyed the city and slaughtered thousands of Philippine men, women and children. At the close of the conflict the commander of Japanese forces in the Philippines, General Tomoyuki Yamashita, was apprehended and brought to trial. He was found guilty and sentenced to hang. This is a brutal story but one told meticulously that should be remembered.